The Lo Nuestro Award for Regional Mexican Album of the Year is an award presented annually by American network Univision. It was first awarded in 1989 and has been given annually since. The accolade was established to recognize the most talented performers of Latin music. The nominees and winners were originally selected by a voting poll conducted among program directors of Spanish-language radio stations in the United States and also based on chart performance on Billboard Latin music charts, with the results being tabulated and certified by the accounting firm Deloitte. At the present time, the winners are selected by the audience through an online survey. The trophy awarded is shaped in the form of a treble clef. The award was first presented to Si Me Recuerdas by Mexican group Los Bukis. Mexican-American band Intocable holds the record for the most awards, winning on five occasions. 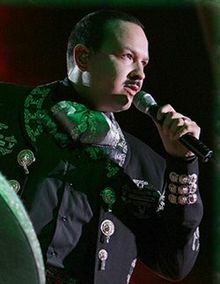 Tejano acts Selena and La Mafia, Mexican bands Banda el Recodo, Bronco, Conjunto Primavera, and singer-songwriters Pepe Aguilar and Juan Gabriel, won the award twice each. Listed below are the winners of the award for each year, as well as the other nominees for the majority of the years awarded. ^ a b c "Historia: Premios Lo Nuestro". Terra Networks (in Spanish). Telefónica. February 6, 2006. Retrieved June 10, 2013. ^ Lannert, John (April 1, 1990). "Univision, Billboard Announce Latin Music Awards Nominees". Sun-Sentinel. Tribune Company. Retrieved August 16, 2013. ^ a b "Ricky Martin, Shakira, Thalía, Ricardo Arjona, Pepe Aguilar Y Vicente Fernández entre las superestrellas nominadas para el Premio lo Nuestro 2004". Univision. Business Wire. January 14, 2004. Retrieved September 27, 2013. ^ "Lo Nuestro 1989 – Historia". Univision (in Spanish). Univision Communications. 1989. Archived from the original on October 17, 2013. Retrieved September 29, 2013. ^ "Lo Nuestro 1990 – Historia". Univision (in Spanish). Univision Communications. 1991. Archived from the original on October 15, 2013. Retrieved September 4, 2013. ^ Lannert, John (May 24, 1991). "Hispanic Music Industry Salutes Its Best Wednesday". Sun-Sentinel. Tribune Company. Retrieved August 16, 2013. ^ Lannert, John (June 1, 1991). "Latin Music Finds Harmony In Awards Crisp, Entertaining Tv Program A Breakthrough For Fledgling Trade Group". Sun-Sentinel. Tribune Company. Retrieved August 16, 2013. ^ Lannert, John (November 28, 1998). 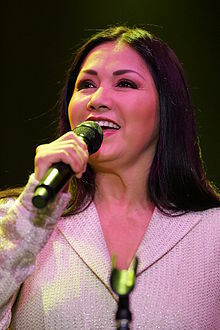 "Ana Gabriel Captures 4 Latin Awards". Billboard. Nielsen Business Media, Inc. 104 (22): 10. Retrieved August 21, 2013. ^ "Lo Nuestro 1993 – Historia". Univision (in Spanish). Univision Communications. 1993. Archived from the original on June 9, 2012. Retrieved January 3, 2013. ^ "Lo Nuestro 1994 – Historia". Univision (in Spanish). Univision Communications. 1994. Archived from the original on August 13, 2012. Retrieved September 26, 2013. ^ "Lo Nuestro 1995 – Historia". Univision (in Spanish). Univision Communications. 1995. Archived from the original on October 17, 2013. Retrieved September 26, 2013. ^ "Univision Announces the Nominees for Spanish-language Music's Highest Honors Premio Lo Nuestro a la Musica Latina". Univision. Business Wire. March 27, 1996. Retrieved June 11, 2013. ^ "Lo Nuestro 1996 – Historia". Univision (in Spanish). Univision Communications. 1996. Archived from the original on June 14, 2012. Retrieved June 10, 2013. ^ "Premios a Lo Mejor De La Música Latina". El Tiempo (in Spanish). Casa Editorial El Tiempo S.A. April 8, 1997. Retrieved June 10, 2013. ^ "Lo Nuestro 1997 – Historia". Univision (in Spanish). Univision Communications. 1997. Archived from the original on October 17, 2013. Retrieved June 10, 2013. ^ Barquero, Christopher (1998). "Premios Lo Nuestro: Los galardones a la música latina serán entregados en mayo próximo". La Nación (in Spanish). Grupo Nación GN, S.A. Archived from the original on June 15, 2013. Retrieved June 14, 2013. ^ "Lo Nuestro 1998 – Historia". Univision (in Spanish). Univision Communications. 1998. Archived from the original on October 17, 2013. Retrieved June 14, 2013. ^ "¿Quiénes se llevarán esta noche el Premio Lo Nuestro "99?". Panamá América (in Spanish). Grupo Epasa. May 6, 1999. Archived from the original on June 15, 2013. Retrieved June 15, 2013. ^ "Lo Nuestro 1999 – Historia". Univision (in Spanish). Univision Communications. 1999. Archived from the original on June 23, 2013. Retrieved June 15, 2013. ^ "Lo Nuestro tiene sus candidatos". La Nación (in Spanish). La Nación, S.A. de C.V. April 15, 2012. Retrieved June 18, 2013. ^ "Lo Nuestro 2000 – Historia". Univision (in Spanish). Univision Communications. 2000. Archived from the original on October 17, 2013. Retrieved June 18, 2013. ^ "Premios Lo Nuestro: Votación 2001". Univision. Univision Communications. 2001. Archived from the original on November 29, 2014. Retrieved August 14, 2013. ^ "Premios Lo Nuestro: Alfombra Roja: Lista completa de los ganadores de Premio Lo Nuestro 2001". Univision. Univision Communications. 2001. Archived from the original on October 13, 2013. Retrieved August 14, 2013. ^ "Premios Lo Nuestro: Votación 2002". Univision. Univision Communications. 2002. Archived from the original on October 13, 2013. Retrieved August 20, 2013. ^ "Premios Lo Nuestro a la Musica Latina: Lo que fue Lo Nuestro en 2002". Univision. Univision Communications. 2002. Archived from the original on October 13, 2013. Retrieved August 14, 2013. ^ "Thalia, Alejandro Sanz, Paulina Rubio, Enrique Iglesias, Lupillo Rivera, Carlos Vives, Celia Cruz, Juanes and a Host of Hispanic Artists Compete for the Latin Music Awards, Premio Lo Nuestro". Univision. Business Wire. November 19, 2002. Retrieved September 27, 2013. ^ "Lo Nuestro 2003 – Historia". Univision (in Spanish). Univision Communications. 2003. Retrieved September 27, 2013. ^ "Lo Nuestro 2004 – Historia". Univision (in Spanish). Univision Communications. 2003. Archived from the original on October 13, 2013. Retrieved September 27, 2013. ^ "Univision Announces 'Premio Lo Nuestro' 2005 Nominees". Univision. Business Wire. December 2, 2004. Retrieved September 27, 2013. ^ "Marc Anthony, Pau among top winners". Univision. Univision Communications. 2005. p. 2. Archived from the original on October 13, 2013. Retrieved September 27, 2013. ^ "Nominados al Premio Lo Nuestro 2006". People. Time, Inc. December 12, 2005. Retrieved September 27, 2013. ^ "Shakira Surprise Performer and Big Winner at Last Night's Premio Lo Nuestro Latin Music Awards". Univision. Business Wire. February 24, 2006. Retrieved September 27, 2013. ^ "Montez de Durango y Marc Anthony lideran Premio Lo Nuestro". People. Time, Inc. December 12, 2006. Retrieved September 27, 2013. ^ Mercedes, Rosemary (February 23, 2007). "Intocable, Maná, Rbd, Olga Tañón, Joan Sebastián, Wisin Y Yandel, Monchy Y Alexandra And Aventura Biggest Winners At Premio Lo Nuestro Latin Music Awards". Univision. Univision Communications. Retrieved September 27, 2013. ^ "Nominees for Premio Lo Nuestro 2008 Announced". People. Time, Inc. December 13, 2007. Retrieved September 27, 2013. ^ "Ricky Martin, Maná y Juan Luis Guerra, triunfadores en los Premios Lo Nuestro". 20 minutos. Multiprensa & Mas S.L. February 22, 2008. Retrieved September 27, 2013. ^ "Juanes, Wisin y Yandel, Gilberto Santa Rosa, El Chapo De Sinaloa and Maná among Top Nominees for Premio Lo Nuestro 2009 on Univision". Bloomberg. Bloomberg L.P. January 14, 2009. Retrieved September 27, 2013. ^ "Premio Lo Nuestro 2009". Daily News. Daily News, L.P. 2009. Retrieved September 27, 2013. ^ "Full List of Nominees Announced for 22nd Edition of Univision Prestigious Premio Lo Nuestro Latin Music Awards". Bloomberg. Bloomberg L.P. December 1, 2009. Retrieved September 27, 2013. ^ "Aventura is Biggest Winner of Premio Lo Nuestro 2010; King of Bachata Group Wins Five Awards, Including the First Ever Entertainer of the Year Award". Univision. Business Wire. February 19, 2010. Retrieved September 27, 2013. ^ "Juan Luis Guerra, Enrique Iglesias y Camila, los más nominados a Premios lo nuestro". E! News (in Spanish). E! Entertainment Television, Inc. December 3, 2010. Retrieved September 27, 2013. ^ "Lista de Ganadores de Premio lo Nuestro 2011". Univision. Univision Communications. February 17, 2011. Retrieved September 27, 2013. ^ "Lista de nominados al Premio Lo Nuestro a la Música Latina". Terra Networks (in Spanish). Telefónica. December 1, 2011. Retrieved September 27, 2013. ^ "Ganadores de Premio Lo Nuestro 2012". Univision. Univision Communications. February 16, 2012. Retrieved September 27, 2013. ^ "List of Nominees Premio Lo Nuestro Latin Music Award 2013" (PDF). Univision. Univision Communications. 2013. Archived from the original (PDF) on October 13, 2013. Retrieved September 27, 2013. ^ "Lista de Ganadores de Premio Lo Nuestro 2013". El Universal (in Spanish). Compañía Periodística Nacional. February 22, 2013. Retrieved September 27, 2013. ^ "List of Nominees Premio Lo Nuestro Latin Music Award 2014" (PDF). Univision. Univision Communications. 2014. Archived from the original (PDF) on December 12, 2013. Retrieved December 9, 2013. ^ "Enrique Iglesias and Romeo Santos Lead Nominations for 2015 "Premio Lo Nuestro a La Musica Latina"". Univision. Univision Communications. December 2, 2014. Archived from the original (Press release) on January 20, 2015. Retrieved January 19, 2015. ^ "Premio Lo Nuestro 2015: La lista completa de ganadores". People en Español. Time Inc. February 19, 2015. Retrieved 20 February 2015. ^ Flores, Griselda (December 1, 2015). "Premio Lo Nuestro 2016: Lista completa de nominados". Variety Latino (in Spanish). Penske Media Corporation. Retrieved April 11, 2016. ^ "Lista completa de ganadores en Premio Lo Nuestro 2017". La Opinión (in Spanish). ImpreMedia. February 23, 2017. Retrieved October 20, 2017. ^ Cite error: The named reference lonuestro-nominees-2019 was invoked but never defined (see the help page).